Rub the fillet with oil and season to taste with salt and pepper. Heat the butter and the oil together in a frying pan and brown the fillet all over. Place in a roasting pan and roast in a preheated oven at 200°C for 20 – 25 minutes or until done to your liking. Cover with foil and leave to rest for 5 minutes. 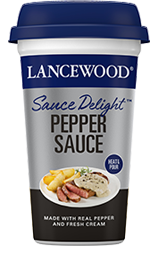 Remove the foil and place the LANCEWOOD Sauce Delight™ Pepper Sauce tub in the middle of a microwaveable plate, heat for 1 minute, stir and heat for another minute. Slice the fillet and drizzle the sauce over just before serving.